One question always pops in mind when I cook Chinese cuisine. What's the difference between Chinese food cooked in India and Chinese food cooked in China? Is it the food, method, ingredients or the seasoning? Well… We know the answer. Surprisingly everything :) I prefer Chinese food cooked in Indian way. Blame it on the taste bud we have. It is almost impossible for me to like bland, almost spice less food. That’s why even when I cook Chinese food at home I call it my Indo-Chinese cuisine. I make lot of changes to suit our palette. Here is the recipe for making crispy mushroom cups which is actually stuffed mushrooms with vegetables blended with sweet, spicy and tangy sauces. I got this recipe from Tarla Dalal’s website and made some alterations according to my preference. I made a big mistake of frying them in open kadai which was indeed a big blunder. Because of moist blanched mushrooms and sauces, it was bit difficult to fry as oil started splashing around. The electric fryer, which came to my rescue, is the best one for frying these. 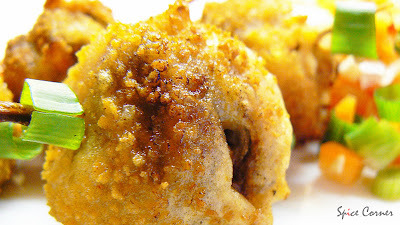 So if you don’t have electric fryer, be careful while frying these stuffed mushrooms. You can also make thick coating of corn flour paste which will help to bind these stuffed mushrooms. Place mushrooms in boiling water and leave them there for 2-3 minutes. Pat dry and remove their stems. Squeeze out excess water and keep them aside. In a mean while, heat about 1 tbsp of oil in wok and add chopped garlic. Sauté it for few seconds and then add spring onions, very finely chopped capsicum/peppers, carrot, beans, cabbage and ajinomoto. Sauté them for 1 minute and add soya sauce, chilli sauce, tomato ketchup, rice vinegar and salt and pepper to taste. Mix well and remove from fire to cool. Stuff this mixture in each mushrooms and pin up two mushrooms with tooth pick so that the filling doesn’t spill out. Prepare thick batter of corn flour, maida, chilli powder and salt with enough water. Make sure that you get the consistency of thick dosa batter. 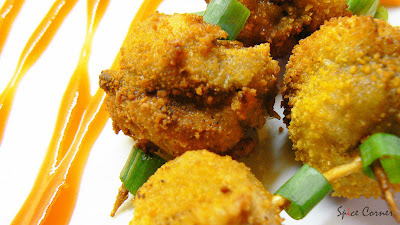 Dip each pinned up mushrooms in this batter so that they are coated evenly. Roll them over bread crumbs and deep fry in electric fryer till they turn golden brown. Serve immediately with any dipping/sauces of your choice. 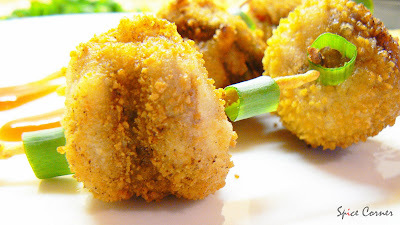 These can be served as appetizers or as a side dish with Shezwan Rice/Noodles(Will post the recipe soon) and enjoy. When KFC (Kentucky Fried Chicken) first translated its advertising slogan "finger lickin' good" into Chinese, it came out as "eat your fingers off." MSG has very little flavor of its own, but it 'improves' or enhances the flavor of other foods it is used with. Some individuals seem to be sensitive to MSG, and exhibit what is known as 'Chinese Restaurant Syndrome' (because of its use in Asian cooking). The symptoms include headaches, chest pains, facial pressure, burning sensations, and sweating. The FDA continues to list it as GRAS (Generally Recognized As Safe), but all foods containing MSG must state so on the label. Although it is true that Ancient Chinese warlords would send messages hidden inside cakes, fortune cookies are not Chinese, they were invented in Los Angeles around 1920. This is my kind of food. Love mushrooms and these little cups look delicious. Your stuffed tomatoes also look delicious. Just came to check you blog before I leaving to school. first you suffocate it with batter, then you throw it in hot oil. just to make sure it's dead, you poke a skewer through its heart. what did it do to you, sia? Sia, ur dish looks delicious though i dont like mushrooms much :) And am sure, most of the bloggers will agree with u here on our love for indo-chinese :)Started working again? waw supu!! lovely way to present. I just have one doubt. Why do we boil it in water. wont it become sloppy and tender to fry? btw I too like chinese the Indian way. guess it will be much easier to cook them at home than flying here;) do try it sometime and use elecrtic fryer if possible. 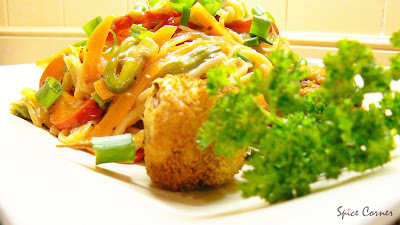 I usually make dry veg manchurian or get the frozen spring roll for appetizer, now I've a good alternate. Do you get good frozen snacks where you live? As far as indo-chinese food, we desi's sure do adapt it so well. Your stuffed mushrooms look scrumptious. As to taste and Indo-Chinese as opposed to Chinese-Chinese: I think most of us prefer our own version of Chinese because the ingredients have been adapted by the Chinese themselves and then by us home cooks to suit our palates. For example, there is a Chinese restaurant here in Barbados that also has a branch in Guynana - same owners, same pool of chefs but the food tastes vastly different. In Guyana, the food is spicer and the abundance and variety of vegetables are reflected in the food. Here in Barbados, the palate is not spicy so the Chinese food here, in terms of flavours is really turned down. The Chinese are cooking to suit the palate of the population. Mushrooms, my favorite. Nice pictures there..Love your presentation with spring onion rings on the either side. So cute. I just love the Indo-Chinese food. The first time I had Chinese here in US, I was totally disappointed. Later learnt that was real Chinese! Your veg balls in garlic sauce and other Indo Chinese recipes are the best! Whenever they say Chinese food Indian style,it makes me smile.There is no such thing but we adapt it to make ours indeed.Looks delicious.Get a splatter guard to cover the wok.It's wide lid with mesh ,catches all the oil,works great for me.Fryer is great too.I love the last photo. sheesh, I don't know how you manage to stuff something as small as mushrooms with so many different ingredients and still bother to fry them! :) No deep frying in Chinese cooking? That's strange.. where have I been all my life? ;-) Actually, I grew up in Singapore, which is 75% Chinese, and I see lots of deep-fried stuff, although it's probably not at all the same as Chinese food in China! thanks for the tip ashakka. i am gonna look out for splatter guard. ohh wow..looks so good. i m a huge fan of mushrooms. I too love Indo-chinese food a lot. Not yet cooked much of chinese though. May be I will start with this. thinking about chinese cuisine oh my when i went to shanghai my taste buds were dying for the spicy food as all food are bland for our taste. Though they don't really deep fry the oil for frying the noodles and vege is too much. Great blog-beautiful presentation and very innovative :). My first comment on your blog. These stuffed mushrooms look so yummy..I wish all these scientists come up with some invention of sending "e-food"..I would have begged you to send me these mushrooms..
sia .. it realy looks fabulous! nice resipe .thanks girl. But once again-LOVE this recipe. Mushrooms are my favorite and this one is soooooooo creative :). Sia, long live Indo-Chinese cuisine! Amen! thank u dear:) glad to know u too love mushrooms:) i find chinese cooking quite easy compared to indian as it takes quite less preparation and cooking time. i know what u talking abt:) i too have had same experience here. Sia, ha ha, who'd have thought dung would be so addictive? 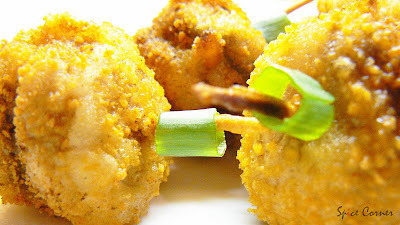 Are you able to use asafoetida in your food since you read about devil's dung? I keep thinking about your comments and laughing since yesterday. I never fried mushroom, I usually bake stuffed mushroom. This is really interesting. Thanks for posting wonderful recipe. I don't think there is no deep frying in Chinese cooking. nice one.the stuffed mushrooms are looking yummy!! 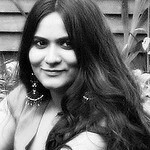 Wow Supriya, I have already bookmarked ur babay corn manchurian recipe and now Iam going to bookmark stuffed mushroom cups too. A very creative recipe and a very wonderful presentation too.The picture has come out very well that it is sure to make everyone's mouth to water when they visit ur blog. Good job !!!! never seen mushrooms look so yummy!!! i never tried baking mushrooms:) have u got any recipe for baking them? i am glad u liked this recipe sush. 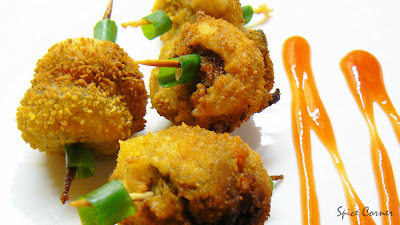 give it a try if u r a mushroom lover:) u can serve them dipped in garlic sauce also. anyway it tastes good.